Pump Control Box with Dry Run and Motor Protection. 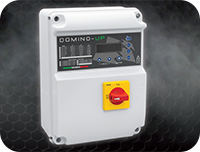 This control box gives any pump complete protection including dry running and overload. This control box is suitable for Submersible and over ground pumps 1/2 hp to 3 hp 230 Volt and has the following built in. This control box does not include a run capacitor. Click the button below to add the Pump Control Box with Dry Run and Motor protection 230 Volt to your wish list.